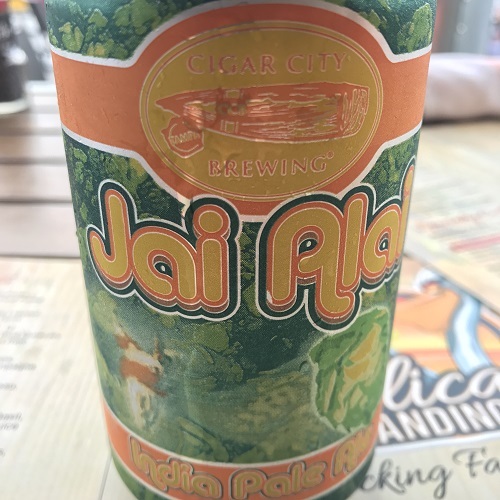 I drank this can of Cigar City Brewing’s Jai Alai IPA not in Tampa, where the brewery is based, but at a delightful canal-side restaurant called Pelican Landing in Fort Lauderdale, Florida. We had a sensational view of the setting sun, and the swordfish tacos were the best I’ve ever had. Tampa was once home to a bustling Jai Alai fronton but sadly all that remains of Jai Alai in the Tampa Bay area is this India Pale Ale that we brew in tribute to the merry game. Seriously, all it takes is one sip and I’m loving this strong and fruity American-style IPA. Jai Alai packs a citrus punch, but it’s no hop bomb. It’s pine, lemon-lime, stone fruit flavours are all balanced and in perfect harmony, making this beer the real deal in terms of quality and execution. I drank it straight from the can, so can’t comment on Jai Alai’s colour, but I will say that I do appreciate the funky design on the front of it (see the pic above). Is this the best beer ever? Cigar City’s Jai Alai IPA could very well be the best beer I had in America. Like the swordfish tacos I ate that evening, I can’t seem to get it out of my head. It was that good. Beer/movie combination: A great beer deserves a great movie recommendation, so crack open a can of Cigar City Brewing’s Jai Alai and go watch The Godfather, Citizen Kane, The Shawshank Redemption or another movie that usually features near the top of the list of best movies ever made.